These two Christmas letters arrived in the mail this morning. One is from my former sorority sister, Patricia Connor from Jamestown, Rhode Island. The other is from my friend Jacqueline Snowden who owns the Snowden Family Clambake in Busman’s Harbor, Maine, where we go in the summer. They are both having such crazy years! Or, I should say, their daughters are. 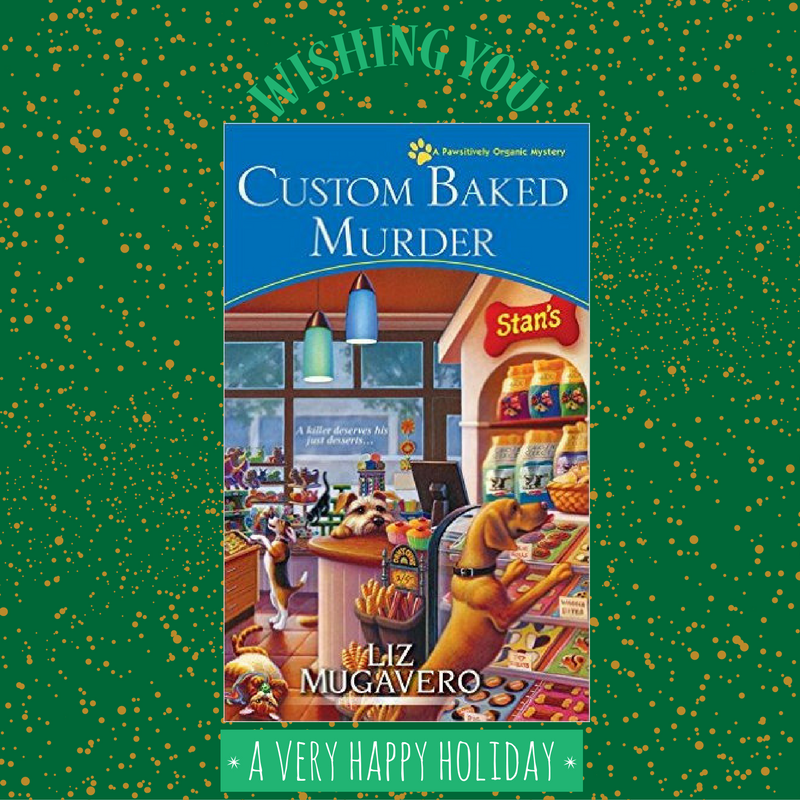 Giveaway: Leave a comment on the blog to be entered to win the latest book about their adventures: Custom Baked Murder, A Pawsitively Organic Pet Food Mystery, or Iced Under, A Maine Clambake Mystery. Season’s greetings from the Connor family! As many of you know, I would normally co-host a holiday party with my daughter Caitlyn at my Jamestown estate, but my life has changed quite drastically over the past year, so I’m writing this letter instead to tell you all about what’s going on in our lives. Let me explain. You may have heard that I’m engaged to a lovely man that I knew long ago, Tony Falco. He’s mayor of a small town called Frog Ledge, Connecticut. I’m sure none of you have heard of it. I hadn’t heard of it either, until my headstrong older daughter Kristan moved there last year. Quite frankly, I’d thought she’d lost her mind. But she’d left her respectable job and seemed to be floundering, so she moved herself to this godforsaken place. When I investigated the town, I discovered that Tony was running for mayor. The rest, as they say, is history. Tony and I are looking forward to a Christmas wedding. Unfortunately, we have to live in Frog Ledge. I only plan to be there part-time. Aside from being small, it seems to have a larger homicide rate than Providence. And my daughter continually finds herself in the middle of these problems. I have no idea how she does it. When she’s not finding bodies and helping solve murders, she’s opened her own business. I must admit at first I thought it was silly - who cooks gourmet food for animals, for goodness sakes? - but she’s become quite the entrepreneur. She’s even opening her own shop soon, after working out of her house for a year. I’m an investor, of course. Kristan has also got herself a boyfriend in Frog Ledge, who I must say is very easy to look at. Admittedly, he’s a lovely man despite the fact that he owns a pub. It seems to be a classy enough place. He moved in with Kristan recently, so perhaps there will be wedding bells for them in the future. My other daughter, Caitlyn, is having a difficult time. She’s in the middle of a divorce from Michael. It’s quite nasty, actually. I won’t comment on whose fault it is. Anyway, she’s not handling it very well. My granddaughter Evangeline seems to be adjusting, fortunately. She’s a darling girl. A bit headstrong like her aunt, actually. And she loves animals like Kristan as well. That’s the important news of the year. I’m excited - and a little nervous - about what the new year holds! Please keep your eyes out for Tony’s and my wedding invitation, and we wish you a wonderful holiday season. This year, for me, not so much. In February, it became obvious that our business, the Snowden Family Clambake, was in deep trouble. When the bank threatened to foreclose, my daughter Livvie hit the panic button and called my older daughter Julia home to bail us out. Julia did, but not without a lot of drama and a dead body. My kids thought they kept the seriousness of our financial problems from me, but with Julia living in my house and fighting with Livvie’s husband Sonny about every single decision…Let’s say I wasn’t as in the dark as they thought I was. It would have been wonderful having Julia home, but she seems to accumulate dead bodies. In the summer, one rolled out of our clambake fire and a young employee of ours was the prime suspect. In the fall, a potential competitor of our business was caught in the lines under an abandoned lobster boat, and bringing up the body also brought up all kinds of unsavory business, some of it involving, ahem, the family. Finally, after Thanksgiving, a body was found in the walk-in refrigerator of the restaurant Julia is running in the off season with her boyfriend, the far-too-good-looking-for-his-own-good (in my opinion) Chris Durand. I am happy to say that Livvie and Sonny are expecting their second child in February. And this time, they are even married. As Livvie always says, “I got engaged. I got married. I got pregnant. Just not in that order.” I am so looking forward to this new addition. Their older daughter, Page, is the light of my life. I am off to put bows on the strawberry rhubarb jam we make in the spring to give to all the neighbors at Christmas. I do wonder why it is that funny grayish color. Julia is bringing an acquaintance from New York home for the holidays. Her name is Imogen Mary Ann Geinkes, pronounced, with initials, as I. M. A. Jinx. What could possibly go wrong? Best wishes for a happy holiday season, and please join me in hoping next year is quieter than this! Barbara Ross writes the Maine Clambake Mystery series. Liz Mugavero writes the Pawsitively Organic Pet Food Mystery series. They both blog with Julianne Holmes on the Wicked Cozy Authors. Make sure to leave a comment! Custom Baked Murder looks delightful. I can't wait to read more. Thanks for the chance! Both of these books sound delightful and I haven't read either one..but if I had to choose I am going with title here...Custom Baked Murder. But really I would be thrilled just to win a book for Christmas. Thank you. Wow so many great cozy mysteries. Happy Holidays!! Oh what fun both of these are. Thank you for the chance to win. I would love to win Custom Baked Murder, it sounds great. I get a couple Christmas letters from old friends and love hearing from them and getting updated on their lives. These books look great, too and I'd enjoy reading them. Thanks for the contest. 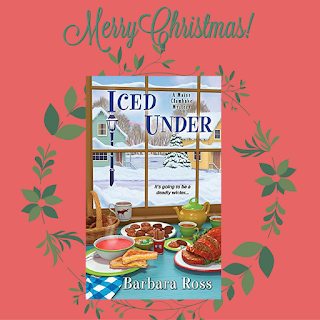 I really love the Clambake series, so I'd love to win Iced Under! bobwiesmann-at-gmail-dot-com. 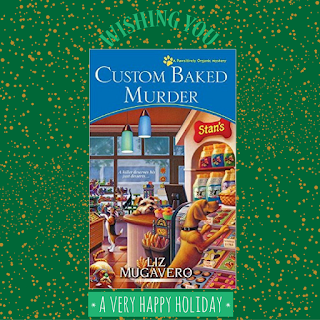 I would love to read A Custom Baked Murder. Thank you for the chance. haha Great Christmas letters! Both books sound great to me. Thanks for the chance to win! Love the Christmas letters. Adorable! I have the first clam baked book in my queue but the Pawsitively Organic Mystery sounds like lots of fun too!!! Another to add to the list! Good thing I have next week off. Thanks, everyone! Happy holidays and good luck with the contest! I can't choose which one to comment on. Both books offer me what I enjoy...entertaining covers, clever mysteries, quirky characters, and the opportunity for a delightful reading experience! I'm in on either book! Thanks to all of you for reading! Good luck! Both books sound amazing. I would really like to read "Iced Under". Thanks for the chance. Merry Christmas! I like the sound of both books! to me and both sound so interesting. I just love cozy mysteries! They make me happy! Thanks for the chance to win one!! I read both of these series. Merry Christmas! I love buying my furkids treats! I'd be pleased as punch with either of these books! I love cozy mysteries, thanks for the chance to win. This has happened to me, too! What a fun post! (Of course leave me out of the drawing..) Love that three of your characters got together. Congratulations Patricia! Living in Frog Ledge sounds like a recipe for inspiration. Oh, both these books sound great. Love the "Frog Ledge". Thanks for the chance! Both of these sound great. Thanks for the chance! the letters are fun! hope all have fun holidays! 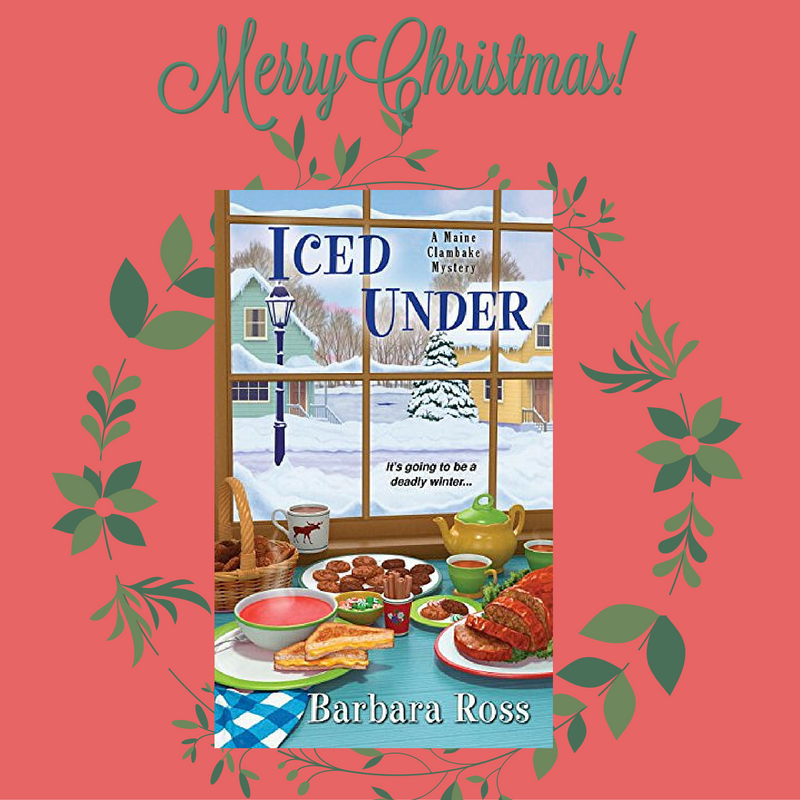 I love the Christmas letters and would be thrilled to win a copy of Iced Under. Thanks for sharing these fun newsletters. I actually enjoy Christmas newsletters and I'm sorry that more people haven't continued with this tradition.